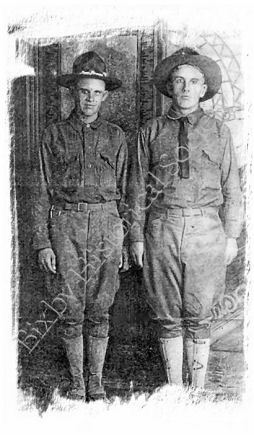 Harvey E. Crosby was one of several young men from the Bixby area who enlisted in the National Army during World War I. He was born in Mississippi and had only lived in Bixby for a few years prior to the War but had made many friends in his “adopted hometown.” He and his mother, Anna Elizabeth Crosby, lived on West Breckenridge across from the Floyd Waymire residence. Soon after Harvey enlisted, he and his friend and neighbor’s cousin, John T. Waymire, found themselves on a train headed for Camp Bowie in Texas. At Camp Bowie they were assigned to the 358the Infantry, 90th Division. Thousands of young men were being trained to be soldiers in camps springing up all over the country. While it was hard work, it also was an exciting adventure to many of the young soldiers. In April 1918, Harvey was on leave from Camp Bowie and back in Bixby to visit his family and friends. While he was there, the town held a huge patriotic Liberty Day Celebration. Between 2500 and 3000 people watched as local merchant, J. Farris, presented a very large American flag to Mayor E. E. Norvell. Private Harvey Crosby was given the honor of raising Old Glory to the top of a newly constructed flagpole in the center of the intersection of Dawes and Armstrong Streets in downtown Bixby. After returning from leave, Harvey, John and several thousand other young soldiers soon found themselves on a troop ship headed toward France. This was the first time most of them had ever seen an ocean, much less crossed one. At times they were not sure which was worse, the constant threat of German U-boats or the rough seas. They had heard that the War was not going well for the Allies but were confident that once the “Yanks” got into battle the War would soon be won. When the 358th arrived in France it was assigned to the American Expeditionary Forces under the command of General John J. ‘Black Jack’ Pershing. The new troops were soon ordered to the front lines. There they saw for themselves the grim reality of war; the overwhelming stench of death, the agony of the wounded, the never-ending mud, and the total devastation all around them. Harvey observed his twenty-sixth birthday, July 18th, near the front lines, just a month after his unit reached France. In August of 1918, the Allies began a counterattack. The fighting was fierce but the Allies, along with the new American troops, began to slowly push the Germans back. Late in the evening of September 19, 1918, Pvt. Harvey Crosby was killed by machine gun fire during the fighting around St. Quinton in northern France. His friend, John Waymire, was close by when Harvey was gunned down. He was buried in France, not too far from where he fell. But that was not the entire story. Harvey E. Crosby had a twin brother. On the day he went to the recruiting office there were two young men who wanted to enlist — Harvey and his identical twin brother, Fred ‘Louie’ Crosby. The recruiter realized that if both brothers enlisted there would be no one at home to take care of their widowed mother. He told them that he could not let them both enlist. That they needed to decide what they wanted to do. They understood and agreed, but they both still wanted to volunteer. Finally, they decided to flip a coin to decide who would stay behind and who would get to enlist and leave to serve their country. They flipped the coin and Harvey won. He was the brother that enlisted in the Army that day in 1917. A simple flip of a coin sent one brother back to the farm fields of Bixby and the other brother to the battlefields of France. After the war, Louie Crosby and his mother moved to Missouri, but Louie would return to live most of his life in Tulsa. He died in March of 1969 at the age of seventy-six. © 2008 All Rights Reserved. Published with permission.